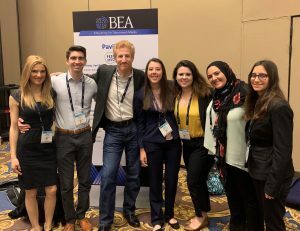 University of Florida College of Journalism and Communications Telecommunication alumni and students were recently honored in the 2019 Broadcast Education Association (BEA) Festival of Media Arts – News and Student Film and Video Competitions. In the Student and Video Competition Narrative category, Tamara Dobry, and Christopher Petow, both B.S. Telecommunication 2018, won second place for their film “I Remember.” The film was their final project in Telecommunication Professor James Babanikos’ Advanced Production Workshop course. CJC student award winners with Telecommunication Associate Professor Tim Sorel and Telecommunication Lecturer Iman Zawahry. The BEA Festival of Media Arts is the world’s largest digital media and broadcast competition for students and faculty. The 2019 competition featured 295 awards from over 1,500 entries received from 300 participating schools. 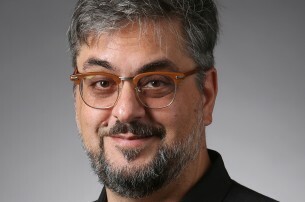 The competitions for faculty and students cover the range from dramatic narratives, through non-fiction documentary and news to the frontiers of interactive multimedia. 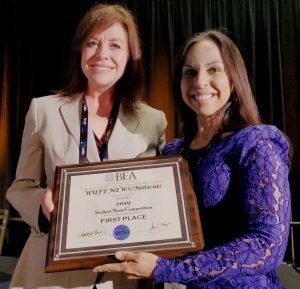 The awards were presented at BEA Conference held in Las Vegas from April 6-9.